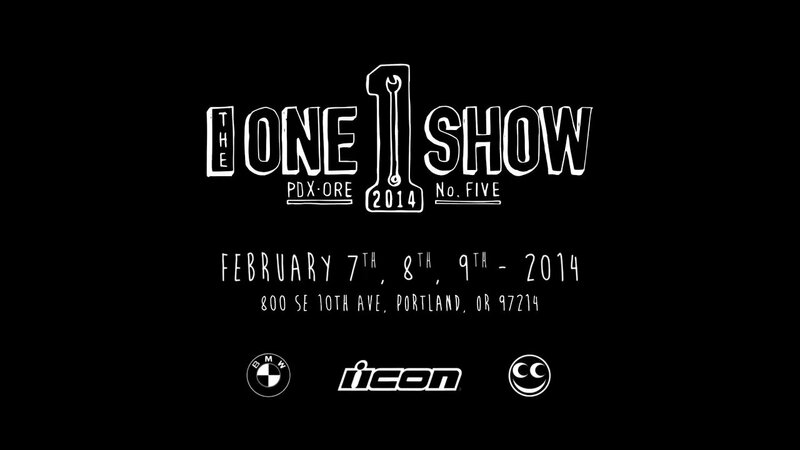 OK People, Here it is, The One Motorcycle Show in Portland. This will be one the the best shows on the calendar, there are so many cool builders there and a great chance of meeting up with them and having a chin wag and of course, seeing what everyone else has made. If you can only make it to one show, make it to this ONE. A fun event with many different styles of Motorcycles and of course cool art work, helmets and a ton of great ideas that have been put into these machines and inside too. People from all over the place will be attending and you can be certain there will be something for everyone’s taste, real builders, real people and all approachable. So, get these days booked up and get your Arse into gear and we shall see you there. 5 years ago when we hosted the first One Motorcycle Show, we wanted to get people together for an event centered around the idea that the greatest bikes were the ones built, restored, re-worked, re-invented and re-imagined for a reason. We wanted to bring the builders and bikes together, give them a place to tell a story, and make some friends with other like-minded folks. A motorcycle show for motorcyclists by motorcyclists. We’re particularly excited about this years show. It has been our simple and always challenging goal to make each show twice as good as the year before. With that in mind, we listened to the comments and suggestions from last year. The overwhelming consideration was that we had outgrown the space. Over 120 custom motorcycles + 6-8,000 attendees a day… we need a bigger space. We’re very excited to announce that we have a new location about a ½ mile away with twice the amount of space. It’s the building of One Show Dreams. We are very pleased to announce once again that the show is FREE to exhibit and to attend. This show is the culmination of the hard work volunteered from everyone involved, and the sponsorship from brands and companies who see the value in an event like this. For more information, log onto Facebook or follow @the1moto on Instagram. Q. I have a question and I don’t see the answer here. A. Email info@theonemotorcycleshow.com for more info. Please don’t call the venue directly. A. Feb. 7th from 6pm-1am — Feb. 8th 11am-12am — Feb. 9th 11am-3pm. RSVP and join the pre-show conversation on Facebook. A. If you are a human you can come. Please no pets. If you are under 21, sorry no booze. A. Motorcycles reserved parking out front. Cool cars across the street from entrance. everyone else there is plenty of neighborhood parking. Please be careful of the city parking laws you will get towed. Q. Is there Food and beverages? A. Yes, we have food vendors, and a variety of beverages including beer and wine. A. Yes See See Motorcycles will have a coffee cart. A. Yes but if you forget we have an ATM available. Q. Can i buy goods? A. Yes, Portapoty, sorry people clogged the toilets last year. Q. What kind of bikes will be there? A. Look at the builders list below. Q. Is there Motorcycle art? A. Yes, look at artist list. Q. Can i bring in outside food and beverage. A. No! We must operate under county health codes please be considerate. Q. Can i bring flyers to my event? A. No, we would rather people respect the bikes in the show, thats why we put on the show. Q. Other things to consider? A. Please be nice, this show is the accumulation of the hard work by the community, all it takes is one sour situation to change the way the show operates, be considerate, and have FUN. This entry was posted in Blog and tagged bobber, brat, BSA, cafe racer, chopper, custom, harley, Honda, kawasaki, rocker, suzuki, ton up, triumph, vintage, yamaha.